Updated: This good-looking laptop hits all the right notes especially with this price cut. The Teclast F7 has got everything right bar the battery life. From the design, through to the performance and the build of the laptop, this is a mature and capable product worth acquiring. The flow of MacBook-like laptops from China continues unabated. After the Teclast F6 Pro, the Chuwi LapBook Air and the Alldocube Thinker i35, we get to scrutinize the Teclast F7, which was launched earlier this year – but we received a refreshed model, one that comes with an SSD instead of the original slower (and smaller) eMMC storage. Online Chinese retailer, Gearbest, sells the Teclast F7 for just $276 at the time of writing. Note that while this price includes delivery, it is exclusive of any taxes that may be levied by HMRC or the courier companies on behalf of the vendor. Want to buy tech from online Chinese retailers? Read this first. (Note: At the time of writing, and for a limited period, Gearbest is providing a free sleeve and a wireless mouse worth just over $14 for every purchase of the F7). Teclast’s F7 uses a tried-and-trusted chassis, one that we’ve seen a gazillion times before, which takes cues from the original Apple MacBook Air. So, you get a large hinge, a brushed metal silver/aluminum finish, a matte display, a large touchpad with a notch underneath, a wedged profile, four black rubber feet and tapered edges. It’s as if Chinese laptop manufacturers have been reusing Apple’s production lines after the firm changed the design of the MacBook. The only differences are smaller bezels, more ports, and Teclast’s name etched on the top cover (in white). There are two USB 3.0 ports, one microSD slot, a microHDMI output, one audio port and a proprietary power connector. The F7 feels solid with little flex on the keyboard or display, but we’re not big fans of the bottomless USB port design. 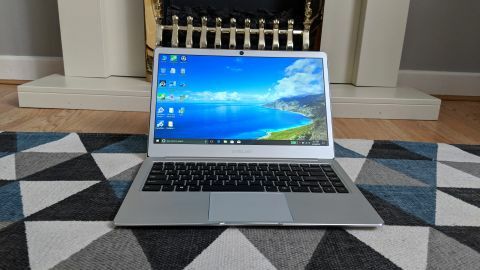 Even with a 14-inch display, this laptop is reasonably thin and light, occupying a slightly bigger footprint than an A4 page with a thickness of around 16mm and a weight of just over 1.34kg. This notebook isn’t in the Dell XPS 13 category, but it’s close enough. This is an Apollo Lake-based device with 6GB of non-upgradable RAM and a 128GB M.2 SSD which can be replaced by a bigger capacity model. As with the F6 Pro, this is one of Teclast’s own SSDs, the NS550-2242. Teclast is the only laptop manufacturer we know of that uses its own-brand storage. Engineers have also incorporated a pair of microphones with noise reduction capabilities to deliver better performance when working with Microsoft’s Cortana. The rest of the spec sheet includes a 50Whr battery, 802.11ac Wi-Fi, Bluetooth 4.2 (thanks to the Intel Dual-Band Wireless-AC 3165 solution), plus Teclast judiciously bundled a white monobloc power supply unit, a 12V,2A (24W) affair, with a long cable. Impressive!